Before I even start, let me say this. Picking winners was unbelievably difficult because from a musical perspective, 2009 was a VERY good year. While it is easy to vote anonymously in a website poll, it is much harder to publicly state my preferences, when I know so many of the people involved. Suffice it to say that while there can only be one “best” in each category, I loved just about every song and album that was nominated for these awards. Best Album: Taamu – Benny Friedman. No contest here. While Kulam Ahuvim proved that Mordechai Ben David is still the reigning king of Jewish music and is more than capable of keeping up with the “youngsters”, Taamu was a rock-solid album, top to bottom. Kulam Ahuvim was very, very good. Taamu was even better. Every song was a winner and Benny Friedman is THE man to look out for in the years to come. A tremendous yasher koach to not just Benny, but the entire team that made this album the runaway success that it is. I won’t embarrass any of you by singling you out by name. You know how you are. Best Song: How am I supposed to pick just one? B’Inyan Hasimcha is a crazy lyrical delight and proves that either MBD still has his finger on the pulse of Jewish music or is smart enough to surround himself with people who do. V’hi Sheamda? While the Shwekey V version is not as good as the one on Live in Caesaria, there is no question that this song became an instant classic. Both of Benny Friedman’s contributions in this category are fresh, innovative and so well done. I love Letova so much, both lyrically and musically, that every time it comes on in my car, I put it on repeat. Over and over again. Modim by Shloime Taussig? Love it. And you expect me to pick just one? I’m sorry. I can’t do it. I am going to have to proclaim this one a tie. I have to vote for V’hi Sheamda, because in twenty years you will still be hearing people singing this song at weddings and trying to make it fit into Kedusha on Shabbos morning. But Letova is the song that won my heart. It is so good that not only do we all walk around the house singing it, but it is the ringer on my cell phone. Best Debut Album: Taamu – Benny Friedman. It is so rare that a debut album is so consistently solid, where every single song is good. Think about some of the top names in Jewish music today. Their debut albums had only a handful of good songs, but it was enough to propel them to stardom. The only other debut album I can think of off the top of my head where every song was a winner was Shloime Gertner’s Nissim. Taamu has it all. Great songs, great arrangements and most of all, Benny’s golden voice. But that’s only part of the package. If you ever have the privilege of meeting Benny, you will find out that he is sweet, eidel and temimusdik. This guy has it all. Watch him climb to the top of the Jewish music ladder very, very quickly. Best Arrangement: Every single song in this category is worthy of bearing the title “Best Arrangment”. Going alphabetically, Mo Kiss’ Az Yashir transports you to another time and place and positively rocks. Shua Kessin’s Bye Bye Bye, is a great song and fun to sing along with, especially when you get to “l’shmay may may may may kadisha yakira”. Kulam Ahuvim? A worthy title track to a very strong album. No Lyrics? Bizarre name to a wilder than wild song that still manages not to cross the line. And there just aren’t enough words for to describe just how much I love the cheerful Yovo, which is arranged to perfection. If I have to pick just one song, it is going to have to be the one that I find myself putting on repeat in the car, turning the volume all the way up and setting the bass so far up that the windows actually vibrate. The song? Benny Friedman’s No Lyrics, the song that defies logic and explanation. It is a niggun that is unlike any other out there. The arrangement on this killer song takes you to a place that is almost dark, almost dangerous, yet somehow never evolves into something I wouldn’t want my kids to listen to. No question, in a category full of unbelievably good songs, No Lyrics stands head and shoulders above the rest. Boys Choir Album: Given that I have close personal ties to one of these choirs, there is no way I can vote objectively in this category and I am going to have to sit this one out. A good thing, too as there are a few very serious contenders here. Each choir has it’s own unique sound and this would have been a very difficult decision for me. Best English Song: This one easily goes to innovative newcomer Shua Kessin and his song Generations. If you think coming up with a hit song is hard, it is even harder when you don’t have the timeless words of Dovid Hamelech’s Tehillim to fall back on. An English song done right, is a very rare gem and they are few and far between. This song showcased Kessin’s voice and there was something about it that really appealed to me. Honorable mention to Miami Boys Choir’s Me’im Hashem. What makes this song great is that the music doesn’t go quite where you expect it to and the words don’t either, taking this song to a whole new level. 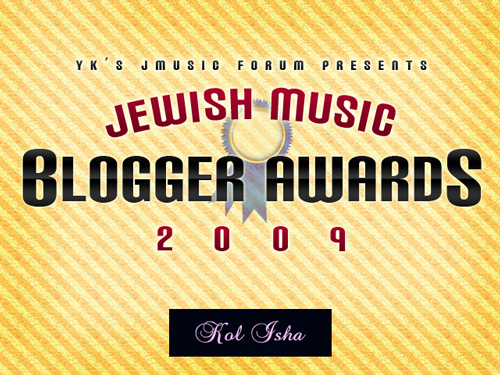 Best Yiddish Song: Emes – Benny Friedman. It’s not that I love Benny’s album so much that I am voting straight Benny. It’s that even though I didn’t understand 85% of the lyrics to this song, it still worked for me. So while the language barrier generally kills Yiddish songs for me, this time it didn’t. And that tells me this song is a winner. Honorable mention to Shua Kessin’s Baiten, five minutes and seven seconds of musical fun! Best Concert DVD: I wish I had had the opportunity to see all these DVDs so that I could make an educated choice in this category. Based on what I have seen so far from my fellow bloggers I can only say this: while concert DVDs are a good way for the general public to catch concerts they missed, I don’t know that people are buying tons of them. Do concert DVDs make money? I don’t know. I am guessing they do or we wouldn’t be seeing so many of them. Personally? I love them. $25 for an entire family to see a concert? Sounds reasonable. Throw in the idea that everyone can watch in their pjs, sing along, and get up and dance? Sounds like a great deal to me!